Let me start off by saying the credit cards that I have are heavily weighed into the Star Alliance. I have several Chase cards earning Ultimate Rewards, one Citi card earning Thank You points, and one American Express Blue for Business earning Membership Rewards. Both the Thank You points and Membership Rewards don’t do much for me because I don’t have any premium cards that would allow me to transfer to any useful partner. I still use them to build up my cache of points until I am ready. That being said, at this current stage I am heavy on the Star Alliance for redemptions. I wouldn’t transfer my Ultimate Rewards into British Airways for long haul premium awards. I haven’t put much thought into redeeming with Korean Air, given all the steps and work required to redeem. That leaves me with Singapore Krisflyer and United Airlines MileagePlus, both Star Alliance members. As much as I want to diversify further for better options of flights, I have been thinking jumping into Aeroplan, the loyalty program for Air Canada, another Star Alliance member. In the last few months, I have been researching heavily into signing up for the TD Bank Aeroplan credit card for US residents. This card is not good for pure spend. The idea hinges on using the TD Go cards as part of my strategy. Another part of that strategy was to use the Go cards in conjunction with Evolve, but Evolve recently devolved and are instituting a 3% service fee which completely kills the idea of using that combination. There is no way that I would ever pay 3% for miles or points as a manufactured spend method. If you missed it, one of my strategies for manufacture spending is to build a value chain of activities. While this complicates things, complicated is good. It keeps lesser known avenues alive. It’s not a deal breaker that Evolve is now garbage. The real winning piece with the TD Bank Aeroplan card is the Aeroplan Distinction with the emphasis mine. Basically, it says, no transferred miles of any kind, no sign up bonus, contests, reinstatement of expired miles, or top-up miles count towards the distinction. Any miles that are earned straight into the Aeroplan program count towards the distinction status. If you have distinction status, either silver, black, or diamond, you could start with a 20% off mileage reduction or up to 35% off on Market Fare Flight rewards (only applicable on Air Canada operated flights). Extra bonus miles and a few other benefits like special treatment at Fairmont. You’d also have the ability to earn twice as many points on their online portal as well. 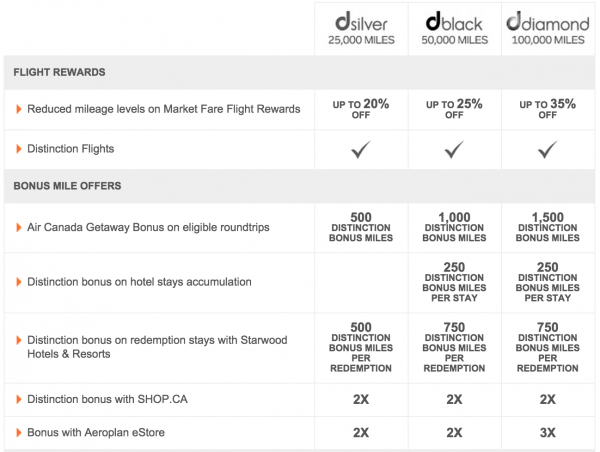 Here’s a great post describing the Market Fare Flight rewards and other benefits on Distinction. I apologize, I can’t find any details in regards to the Distinction program + Starwood. From the chart, it reads like redeeming Aeroplan miles for a night on a Starwood property you would earn back a few miles. As I mentioned at the top, my choices for my Ultimate Rewards for airlines would be United or Singapore, and going into the Aeroplan would further entrench me into Star Alliance. On the earning side of things with the credit card, it’s not good. However, once you cross the 25,000 mile threshold, you now earn an automatic 2x extra miles from the Aeroplan Estore. That would be awesome! Think about it, if there’s a vendor giving you 5x, and you get 2x, that’s a quick 10x. Double dip? Sure, that’s a 20x haul. At least I hope that is my interpretation and not a 5x + 2x. In which case, it’s still not terrible, but 10x is a whole lot nicer. Yes, in 2014, Aeroplan devalued, but if you are getting the extra miles earned from the portal, the devaluation won’t hurt as badly. Not only that, once you hit the dsilver status, and you continually use the portal, you could hit ddiamond real fast and earn at the 3x rate. When you look at basic division, the larger the denominator, the cheaper the miles become in gift card churning (fees/miles or points earned). There have been many times where I am trying to get the denominator as large as possible from the portals and credit card spend, but the math just doesn’t work out sometimes. If the eStore bonus pans out as I interpret, earning miles through gift card churning would be ridiculously easy. I’m not the biggest “fee” conscious person, but I’ve shied away from aeroplan because of their YQ (or at least they used to charge the YQ). That said, I’ve seen many folks successful with them. If I might ask – what are your goals for redemptions? @Trevor I’d use the Aeroplan miles for Europe 1 since they seem to offer the best value. Some of the YQ isn’t terrible and I am willing to eat it. Any update as to whether this or any other TD card earns points for loading TD go? How about now? Sorry if this has been addressed in another post since; I just came across this post. I know this post is really old but I cannot find that much information on the TD Go card. Are TD Go loads with your Aeroplan credit card still earning you Aeroplan miles? Are you still using this to manufacture Aeroplan miles? What kind of volume do you do on these TD Go cards? This seems like an easy opportunity but I want to stay off of TD’s radar. One last question. Do you know if the TD Go card works as a debit card to pay off Citi credit cards over the phone? I am just glad Air Canada resolved the Aeroplan issues earlier this year and integrated it fully. It did have all of us wondering what would happen to it for a long time.